When Steve and I were in Hoi An, Vietnam we took an amazing cooking class and this was one of our favorite dishes. 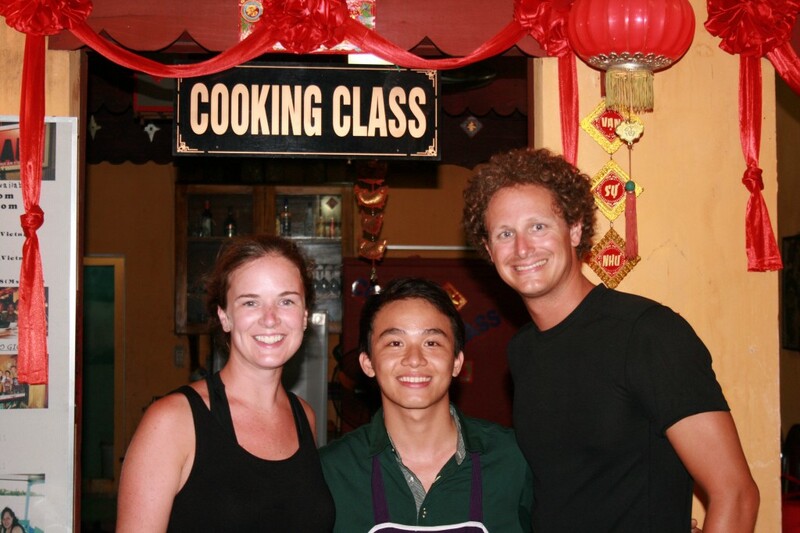 If you ever find yourself in Hoi An and have some dong to spare take a class with Gioan Cookery. We ate so much food we were nearly comatose by the end of our class…it was amazing!!! We unfortunately misplaced our recipe book, so this is our version of Vietnamese Sesame Beef…and it turned out delicious!!! Steve and I with our cooking instructor. 1. Blend lemongrass, garlic, dried chilies and fresh chilies in food processor. 2. Combine oyster sauce, rice wine vinegar, fish sauce, soy sauce, sesame oil, sugar and ginger in a large bowl. Add in the beef then the blended mixture, sesame seeds and half of the green onions. 3. Allow beef to marinate in the fridge for an hour minimum. 4. Grill in a grilling basket (or cook in a skillet) over high heat for approximately 5 minutes per side. 5. Sprinkle the remaining green onion over the beef. Voila!!! Vietnamese Style Sesame Beef!!! P.S. Sur la Table is having a spiffy sale on cookware and bakeware!!! Veteran’s Day Sale! Save 20% on American-Made Cookware & Bakeware at SurLaTable.com! Offer ends 11/11.